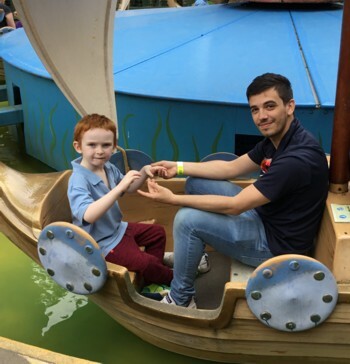 Each year, Cranleigh Rotary sponsors a number of disadvantaged students to takepart in the special Kids Out event at Chessington World of Adventure, which is sponsored by Rotary Great Britain and Ireland. This year, the Cranleigh Club enabled 12 children and 14 carers from Jigsaw School to enjoy the exciting experience on Wednesday, 13 June. The Club purchased their tickets and baseball caps, and the group was accompanied by Rotarian Terry Stewart. The weather was good and the rides scary, but everyone had a great time! 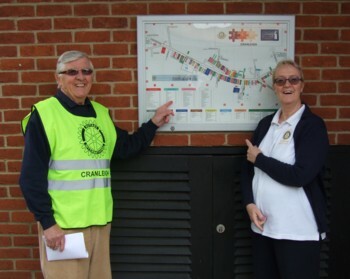 Cranleigh Rotary is always looking for ways to help local organisations and charities, both in and around Cranleigh, and overseas. During June 2018, the Club decided to award £500 to the Cranleigh Guides for new camping equipment, and £500 to Phyllis Tuckwell Hospice. It was also agreed to donate £250 to Mane Chance Sanctuary, a charity that provides respite for horses that are in need of care and treatment. The charity also provides relief for children, young people and vulnerable people who are suffering from physical and/or mental disability, through the provision of managed therapeutic work with horses to help meet their needs and to enable them to participate more fully in society; also to increase the confidence and capacity of children, young people and vulnerable people in need of support through interaction with the horses. 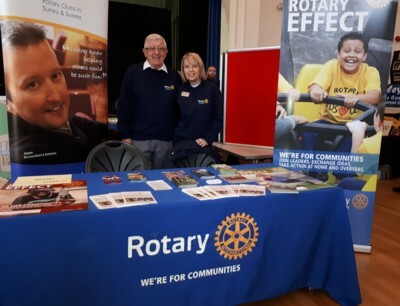 Cranleigh Rotary was pleased to take part in the Cranleigh Village Showcase on Saturday, 28 April. Looking after our stand were Rotarians Patrick Leake, Gail Woodford and Andy Kolmar, supported by visits from other Club members. Although the number of people visiting the Showcase was disappointing, we were able to speak to one or two potential members, some friends from Cranleigh Youth Council and other stallholders. 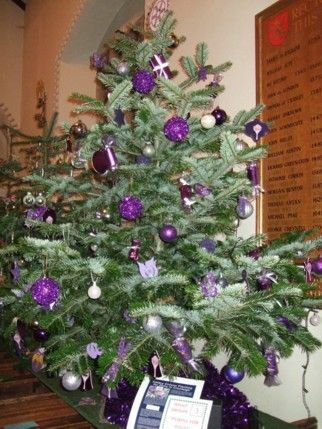 Members of Cranleigh Rotary once again decorated a conifer for the Festival of Christmas Trees, held in St Nicolas Church, 8 - 11 December 2017. This year the theme of the tree decorations was recycling. Cranleigh Rotary's tree was awarded a certificate as the best entry from a Village or Church Group. Well done - once again - to Rotarians Gill Leslie and Teresa Golden for their artistic efforts! Rotarian Jane O'Leary of Oakwood Business Consultants won second place for her tree entered in the Businesses Category. A group of Cranleigh Rotarians, led by Gill Leslie, held a coffee morning at the end of September on behalf of MacMillan Cancer Support. The refreshments and other activities raised £271 for this important charity. Cranleigh Rotarians raised £150 for the Club's charity fund after their efforts in looking after the horsewalk at the Cranleigh Show on 2 July 2017. 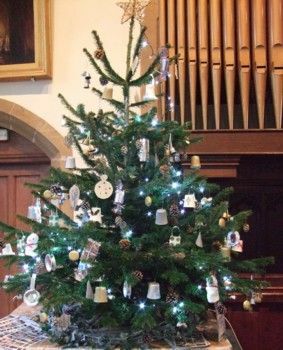 Members of Cranleigh Rotary once again decorated a Christmas Tree for the Festival of Christmas Trees, held in St Nicolas Church, 9 - 12 December 2016. This year the decorative theme was "Purple4 Polio", in recognition of the national effort by Rotary Great Britain and Ireland to publicise Rotary's decade-long efforts to eradicate this dreaded disease from the face of the planet. Well done to Rotarians Gill Leslie and Teresa Golden for their artistic efforts! Since the end of 2015, the Club has donated £400 to support the Chernobyl Children's visit, organised by the Guildford, Godalming & Cranleigh Link; £150 to the Cranleigh Community Fund, which helps people experiencing financial hardship; £100 to Guildford and Godalming Grandmothers’ Group; £100 to Mary’s Meals and £100 to the Surrey, Sussex and Kent Air Ambulance. The Club has once again paid £500 to help the education of two local agricultural students. A local jeweller, Jon Dibben, gave a talk to the Cranleigh Rotary Club on 5 May of his involvement since 2012 with Fairtrade Gold. Jon was presented with a certificate to mark his role as an ethical fine jewellery designer for many years. (See our Facebook page). Members of the Rotary Club of Cranleigh were once again joined by other volunteers to take part in the world's biggest coffee morning on 25 September. The weather was kind as they tempted passers-by to sample their coffee and cake inside and outside of the entrance to the Challenger offices in Moss Alley, near the Village Hall. The collection, which was considerably higher than last year, raised a total of £450 for MacMillan Cancer Support. Cranleigh Rotary Club has started a new project in partnership with the Cranleigh and South-Eastern Counties Agricultural Society to fund bursaries for agricultural students from the local area. Sadly, over the last 30 years, family livestock farms have diminished but there are larger, highly productive farms that make a vast contribution to the economy, enabling us to source our food locally. The idea of this project is to encourage interest in farming in this area as the beautiful landscape of the Surrey countryside is so dependent on the farming community for its production and maintenance. 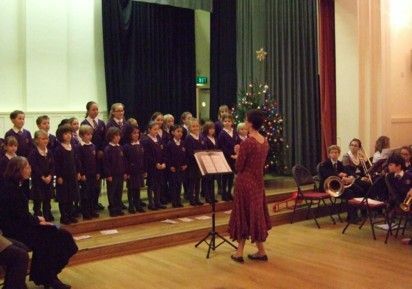 Cranleigh Rotary's Carol Concert, held in the Village Hall on 10 December 2014, once again heralded the start of the festive season. Two schools had agreed to take part, but a bout of sickness unfortunately resulted in the late withdrawal of Cranleigh Primary. However, the choir from St Cuthbert Mayne did us proud and the audience was happy to sing along with a selection of carols. Musical accompaniment was provided by the Cranleigh Youth Bands, led by Iain McDonald. The MC for the concert was Dr. Claire Potter, the local Methodist Priest in Charge, who gave a new slant on the Nativity Story by asking the audience and children to add various sound effects. The retiring collection was in support of the Cranleigh Food Bank, and members of the Rotary Club agreed to round off the sum donated to £250. 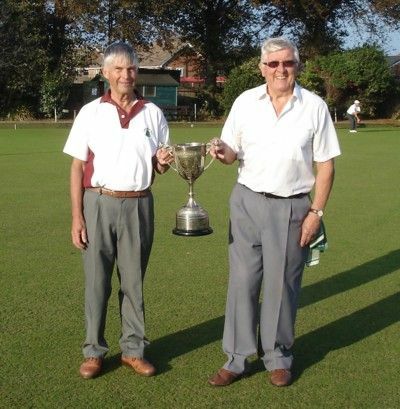 the Rotary Club of Littlehampton to triumph in the final. Members of the Rotary Club of Cranleigh were joined by other volunteers to take part in the world's biggest coffee morning on 26 September. The weather was kind as they tempted passers-by to coffee and cake inside and outside of the entrance to the Challenger offices in Moss Alley, near the Village Hall. 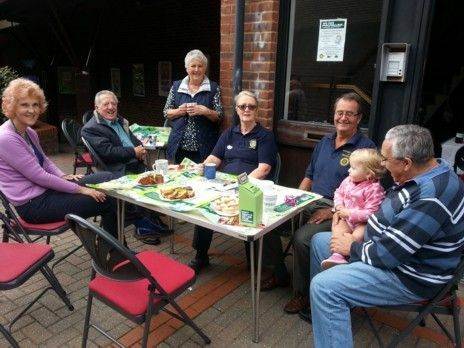 "Pretty table cloths, comfy chairs and attractive crockery encouraged many people to stop and donate to MacMillan Cancer Support," said Rotary organiser, Jane O'Leary. "We had wonderful support, and some people just made a donation as they didn't have time to stop, but the atmosphere was great and we talked and talked all morning. Everyone had a really enjoyable time and we were delighted to raise a considerable sum for this wonderful charity." The collection, with additional donations from Rotarians, totalled £303.34. Left-over cakes were donated to Rowleys Centre for the Community, in time for their afternoon tea. On 11 June, the Rotary Club of Cranleigh took part in the annual 'Kids Out' Day, which is sponsored by the Rotary Club of Great Britain and Ireland. Each year, we pay for parties of disadvantaged children to enjoy a fun day Chessington World of Adventure. On this occasion, the Cranleigh Club sponsored eleven 5 to 6 year-olds, plus 14 carers, from St Joseph's Specialist School for a day at Chessington. The Rotarians collected the children from the school in their cars and delivered them to Chessington. Entry to the World of Adventure was paid for by the Club. The children and their carers were able to enjoy free rides until the early afternoon, when they re-assembled at the car park for the return trip to St Joseph's. "The weather was great, and everyone had a wonderful time," said Rotarian Michael Hart, one of the organisers of the event. 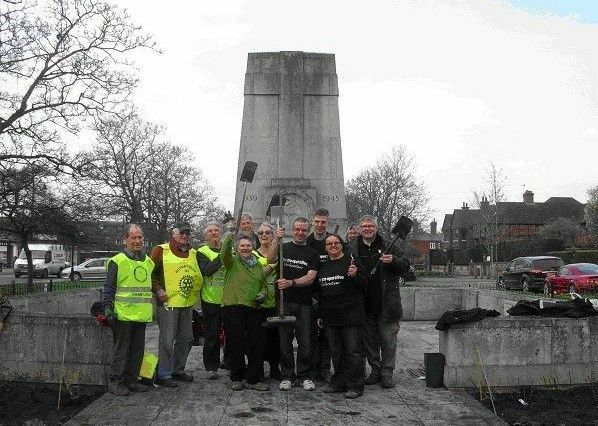 Cranleigh Rotarians took part in the maintenance of some of the village flower beds and were very much involved with the refurbishment of the area next to the War Memorial. Rotarians helped representatives from the U3A gardening club, staff from the local Co-operative, Summerlands Residents Association and Waverley Borough Council representative Jane Bowden, to dig holes and plant over 100 roses and 200 lavender and cornus plants in order to improve the display of plants, flowers and shrubs around the memorial. The work was a key part of the preparations for Cranleigh's entry into the South and South East in Bloom competition, which took place in early July. Rotarians were again involved in the updating of the Cranleigh Business Map, first published in 2010. Four of the new maps have been displayed around the village to assist shoppers in the village who are looking for certain retailers. The maps can be found at the back of the village hall, outside the Parish Council offices, outside Sainsbury’s and on the side wall outside National Westmnster Bank in Stocklund Square.